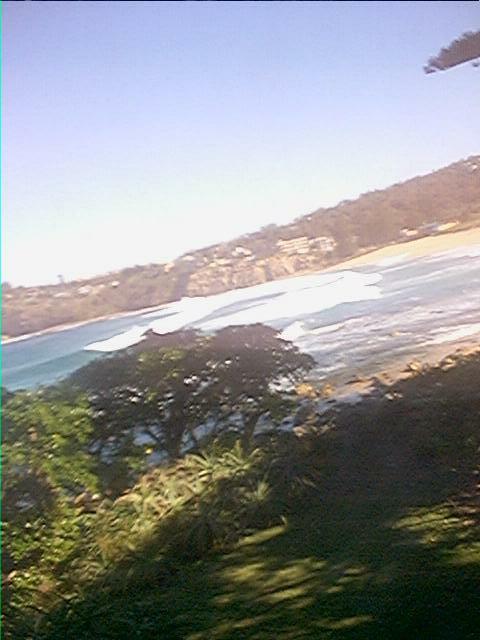 Avalon Beach is a northern suburb of Sydney, NSW, Australia. Goodbye - Due to the sale of the house in which we live we are moving and the webcam will close. Thanks for visiting. The webcam updates every 15 minutes during daylight hours (assuming something doesn't crash). the current camera position the view may seem darker than it really is. Some Local Links: Click to View or Add Links. Surfing Links: Click to View or Add Links. There is a rock pool at the far end, and you may be able to see the Surf Clubhouse, which was recently paited Green and Orange for a Baywatch episode. On the western side of Avalon is Pittwater, which is linked the Hawkesbury River. Avalon is a suburb in the Pittwater Council. The suburb is primarily residential with a medium size shopping centre with a village atmosphere. (The shopping centre is behind the clubouse and pine trees at the right of the photo.) A lot of residents partake is water sports, either in the surf or on Pittwater. Many people move to the area to escape the pressure of city living. It is a 50 minute drive to the city, or a 1 hr 15min bus ride. REAL SYDNEY is a photo study of Sydney. Check it out. Web page by David Miller of Crosscape Technology.